Purchasing your first firearm is a very big decision. Not just the type of gun to get, but the very decision to purchase one in the first place. Owning a gun, regardless of your reasons for owning it, is a major responsibility. It’s not a decision that you can make lightly or on a whim. 1. Why Are you Buying A Gun? – You need to have a clear intention for buying any firearm before you actually do so. Do you want one for sport shooting? For hunting? For concealed carry? For home defense? Or maybe because you believe they could be prohibited or more tightly regulated in the future and you want to buy one while you can. There are many reasons to own a gun, and you need to have a crystal clear reason for yourself before you go out and buy one. 2. How Many Guns Do You Need? – Not how many guns do you want. How many guns do you actually need? You may decide that you need guns for a variety of purposes, such as hunting and self-defense and not just one or the other. Guns are like tools in a toolbox in that each type of gun is meant for a different purpose, and there is no one gun that can do everything for you. 3. Do You Have A Safe Place To Keep Your Gun? – As noted above, gun ownership is a major responsibility. Therefore, you must prevent your gun from getting into the wrong hands, whether it be a burglar or a child, and this means that you need to have a safe and secure place to store it. If you’re buying a handgun for home defense, for example, you can’t just leave it out in the open or even high in a closet. Those places are too easy to find. Rather, you should purchase a safe (even if it’s only a small pistol safe) before you actually purchase the firearm. 4. How Much Money Are You Willing To Spend? – Spending more money than you can afford is very unwise. Therefore, you must think carefully about how much cash you are willing to put down. Keep in mind, your budget has to include more than just your gun. It also has to include holsters, mag carriers, spare magazines, ammunition, targets, and so on. If finances are tight, then you’ll be comforted to know that there are a variety of quality budget firearms available on the market for you, so you may not need to save up over the course of time to buy an expensive one later. 5. Are You Prepared To Spend Time Practicing On The Range? – The old adage goes that practice makes perfect, and this could not be any truer when it comes to firearm ownership. You need to be ready to spend lots of time (and money on ammunition) on the firing range where you can practice drills on drawing and firing the weapon, firing with your offhand, clearing a malfunction, conducting a reload, shooting one handed, shooting while moving, and so on. 6. What Type Of Gun Do You Need? – If you already know your reason for owning a gun, then you should know the general type of gun that you need as well. For example, if you want a gun for waterfowl hunting, you need a shotgun with a long vented rib barrel. If you want a gun for home defense, a shotgun with a shorter barrel or a handgun would do nicely (or both). 7. Which Guns Fit Well In Your Hand? – Once you figure out the general type of gun you want or need, the next thing to do is go to a sporting goods store and manually handle the guns on the counter. Ask yourself what is ergonomic to you and fits well in your hands, and you can narrow your selection from there. 8. Will You Teach Firearm Responsibility To Your Family? – If you have any other family members in your home, it’s critically important that they understand firearm responsibility since they know there is a gun in the house. Your children especially need to be taught that a gun is a weapon and not a toy, and be taught the four cardinal rules of gun safety. The best way to teach firearm responsibility to anyone is not to lecture them, but rather to actually let them handle and shoot the gun on the range. Hands-on experience is always the best form of learning, especially when it comes to shooting. 9. Will You Buy Any Accessories? – Are there any accessories that you were planning on adding to your gun, such as a flashlight or switching out the grips or stock? If so, be sure to incorporate this into your budget and to research specific brands of accessories that receive good reviews. Some accessories are simply necessary, such as spare magazines and holsters. 10. Are You Prepared For The Responsibility of Gun Ownership? – Again, gun ownership is a huge responsibility. It’s very important that you understand that and are ready to experience the benefits of owning one while also holding yourself responsible for any potential ramifications from owning one. This isn’t to discourage you from purchasing a firearm, but it is to help you understand that purchasing a firearm is not a decision that should be made spur of the moment. 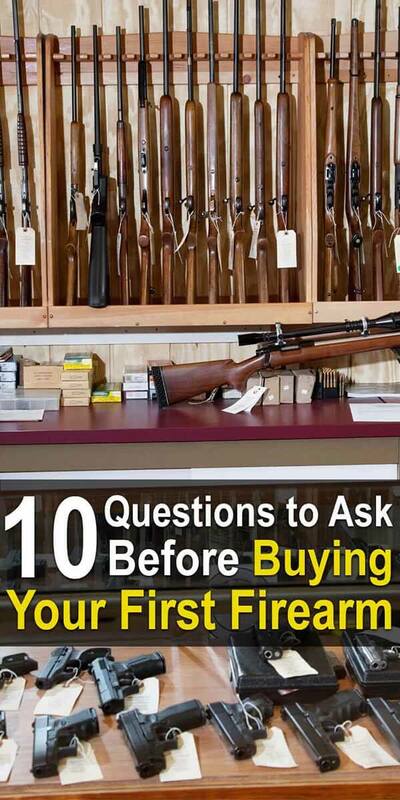 All in all, these are the top ten questions that you will need to ask yourself before purchasing a firearm. By asking and answering these questions, you’ll get a better understanding why you need or want a gun and the factors and responsibilities that come with owning one. As the owner of 17 firearms (and still in the hunt) this article is a bit superfluous. Nevertheless, if there are still folks out there who don’t own one, your article is a good start. The problem I see with most “newbies” is that they don’t apply any serious thought to the points that you raise before purchasing a handgun, shotgun or rifle. Hopefully, your article will encourage readers to objectively assess their motives and needs.